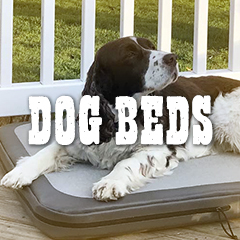 Easy Load Kennels | Custom Molding Services, Inc. Thank you for your interest in the Easy Loader line of dog kennels. We make two dog kennels in two sizes. 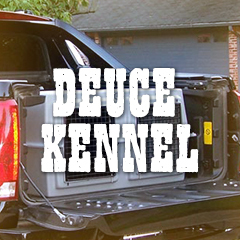 The Easy Loader model fits between the fender wells of all full-size pickups and the Deuce model fits between the fender wells of all compact pickups and in the cargo area of most SUV's. 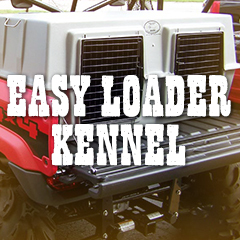 True to their name Easy Loader kennels are a snap to load or unload, at 33 pounds it only takes one person. Easy Loaders are molded using high density polyethylene, the same material used in pickup truck bedliners. An ultra violet stablizer is added to the plastic so it won't crack or become discolored after many years of being in direct sunlight. We offer a full one year warranty (call for details) on material and workmanship. Call 800-853-2655 to order 8a.m. - 5p.m. C.S.T. We ship anywhere in the Continental USA. Please contact us for orders within Oklahoma and outside the Continental USA.